"Every intelligent painter carries the whole culture of modern painting in his head. It is his real subject, of which everything he paints in both an homage and a critique, and everything he says is a gloss." Motherwell was an accomplished writer and editor, as well as an eloquent speaker. 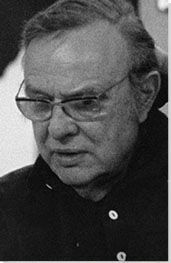 Through his teaching, lectures and publications, he became an unofficial spokesman and interpreter for the Abstract Expressionist movement. Several key themes define Motherwell's work: the dialogue between repression and rebellion, between European modernism and a new American vision, and between formal and emotional approaches to art making. Motherwell was an accomplished printmaker and an avid collagist, and he often used these techniques to engage with and respond to the influences of European modernism. 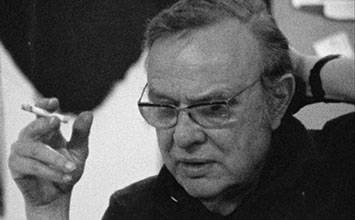 Robert Motherwell was born in Aberdeen, Washington, in 1915, but he would spend much of his childhood in the dry environs of central California, where he was sent in an effort to relieve his severe asthma. The son of a well-to-do and conservative bank chairman, Motherwell was expected to follow in his father's footsteps. From early on, though, Motherwell displayed an affinity for more intellectual and creative pursuits, and his early education included a scholarship to study at the Otis Art Institute in Los Angeles. Pancho Villa, Dead and Alive is a direct reference to a photograph that Motherwell encountered of the murdered revolutionary, Pancho Villa. The work straddles the line between referential painting and the style that would become Abstract Expressionism, and includes several thematic relationships that appear throughout the artist's oeuvre. In its allusion to the Mexican revolution, this work also prefigures the themes that would drive Motherwell's seminal Elegy to the Spanish Republic series. At Five in the Afternoon began as a small pen and ink drawing that Motherwell composed in 1948 to accompany a poem by Harold Rosenberg. A year later, Motherwell reinvented the drawing as a small painting and renamed the work after a line in the poem "Lament for Ignacio Sanchez Mejias," by Federico Garcia Lorca. This work acts as the first entry in Motherwell's Elegies to the Spanish Republic series and sets up a formal and aesthetic system that would define the entire series. Je t'aime No.2 serves as a prime example of Motherwell's second significant series of paintings, which he composed between 1953 and 1957, as his second marriage came to an end. The work exhibits energetic, emotionally charged brushwork, bright, evocative colors, and the artist's trademark ovoid and rectilinear forms. Written across the canvas is the French phrase "Je t'aime," ("I love you") an allusion to the lasting influence of Gallic culture on Motherwell's work, and, no doubt, a reference to the artist's personal anxieties during this time. Elegy to the Spanish Republic No. 110 is part of a series comprising more than 140 paintings, which Motherwell worked on throughout his long career. The series functioned as the artist's memorial to the Spanish Civil War, an event that had come to symbolize for him the human tragedies of oppression and injustice. No. 110 is typical in its stark black and white palette, and interplay of ovoid and bar-like rectilinear forms. What exactly those forms are intended to mean, though, has been the subject of great debate. Some compare them to architecture, or to ancient monuments, while others read them as phalluses and wombs, which, along with the pictures' somber palette, might suggest the cycle of life and death. The Blue Painting Lesson: A Study in Painterly, is part of a group of works composed between 1968 and 1972, known as the Opens series. It shares a simple but powerful formal construct with the rest of the series: a densely colored, almost monochromatic background highlighted by a two or three-sided box that enters the canvas from the top of the composition. This box is an abstract reference to the window views seen in the work of many European masters, and may also refer to the intersection of internal and external worlds in the life of the artist. Tobacco Roth-Handle is a synthesis of collage and printmaking techniques - two important strains in Motherwell's work. The central identifiable image in the print, a cigarette wrapper, is a personal reference; it is typical of the sort of ephemera from the artist's daily life that had begun to find its way into Motherwell's collages by the 1960s. Regarding his collages, Motherwell once said, "The part of my vocabulary that is not from inner pressure, but that is drawn from the external world, is from the social world. To pick up a cigarette wrapper or a wine label or an old letter or the end of a carton is my way of dealing with those things that do not originate in me, in my I."